Hudson’s Bay is offering an extra 15% off this weekend. 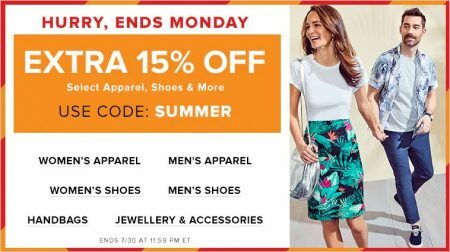 Save an extra 15% off select Apparel, Shoes, Handbags, Jewellery & Accessories, and More when you use promo code SUMMER at checkout. The Bay offers free shipping on orders over $99, or $45 with a HBC credit card. They offer free easy returns. Click here to visit Hudson’s Bay website for more details about this sale.